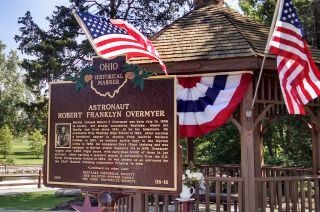 An Ohio Historical Marker was dedicated to NASA astronaut Robert Overmyer on Saturday, Aug. 23, 2014 in Clague Memorial Park, Westlake. NASA astronaut Robert Overmyer, who flew on two space shuttle missions in the early 1980s, was remembered Saturday (Aug. 23) with the dedication of a historical marker in his Ohio hometown. Overmyer, a Marine colonel, served as the pilot of STS-5 in 1982, the first space shuttle mission to be declared fully operational by NASA, and as commander of STS-51B in 1985, a Spacelab mission dedicated to conducting science. He logged more than 12 days orbiting the Earth prior to retiring from the space agency five months after the loss of the space shuttle Challenger in January 1986. Astronaut Robert Overmyer poses for an official NASA portrait. The plaque's inscription further describes how Overmyer was chosen as an astronaut for the U.S. Air Force’s Manned Orbiting Laboratory Program in 1966, before becoming a NASA astronaut in 1969. In addition to his spaceflights on shuttles Columbia and Challenger, he served as a member of the support crew for Apollo 17, the last mission to land men on the moon, in 1972. The marker, which was sponsored by the Westlake Historical Society, is one of almost 1,500 such plaques installed across Ohio that serve to commemorate and honor the people, places and events that were important to the state’s history. Overmyer’s plaque is the sixth to be dedicated in Westlake, and the second state-wide honoring an astronaut (the first, for Challenger crewmember Judith Resnik, was installed in Akron in 2003). According to NASA’s Glenn Research Center in Cleveland, 25 astronauts have hailed from Ohio. James Free, the director of NASA Glenn, spoke at Saturday’s dedication ceremony, which was attended by Kit Overmyer, the astronaut’s widow. A Westlake-local Boy Scout troop participated in the event, which included the laying of white roses.